An abandoned building near Shawnee Mission Parkway and Metcalf has neighbors frustrated. OVERLAND PARK, Kan. — It's Plan B for the Metcalf Crossing Area in Overland Park. 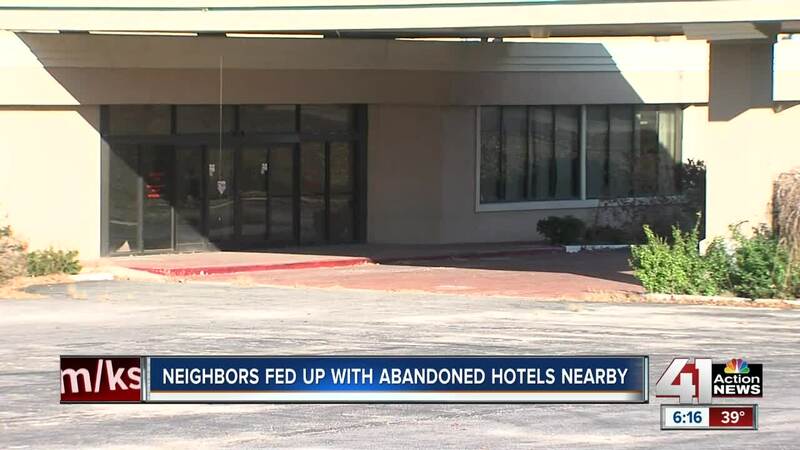 Right now there are two abandoned hotels at Shawnee Mission Parkway and Marty Lane as developers couldn't secure another hotel deal and now wants to put in an office building with a storage facility instead. "It’s just kind of sketchy, you know?" said Andy Aguirre, who grew up two houses away from the lot. "There was constant like strangers basically in your neighborhood." For decades, people in the area say the corner was a magnet for crime but since the hotels shut down, the crime went away. "I’ve seen quite a decline in any type of police activity. You know, people wandering around. It’s been a lot quieter now," said Mike Kromer, owner of Don Freely Auto Clinic. But now Kromer wants answers as to what will actually take its place since his business is right across the street. "An abandoned building being next to you is never a good thing to have," said Kromer. The Overland Park Planning Commission found out earlier this week a new hotel will no longer be part of the plans, but, instead, it will become office space since they couldn't secure any tenants. Also in the plans, over 100,000 square feet of self-storage units. "I was kind of looking forward to having a hotel with maybe some restaurants or something that would be a little more useful to us," said Kromer. But Aguirre thinks offices would make him feel safer in his own home. "If it’s office space they’ll probably have better security, and cameras and that's gotta bring more light to the bottom of the street. And the hotel thing obviously didn't work before so that’s probably the way to go," said Aguirre. 41 Action News talked to one planning commissioner who said one of his main concerns with the project now will be how much traffic this development would cause on the surrounding roads because it's already pretty crowded. This latest proposal goes in front of the city council on Dec. 3.